It's been a whirlwind year for new Gospel and R&B sensation Naturally Seven, who debuted on the New York music scene last winter. In March, Naturally Seven delivered a first and stunning performance at the New York City Regional A Cappella Harmony Sweepstakes at Symphony Space, winning the title of Regional A Cappella Champions and a spot on the prestigious national Harmony Sweepstakes program in San Francisco. In early May, Naturally Seven went on to become Harmony Sweepstakes 1999 National Champions, besting top A Cappella groups from around the country with a performance that one reviewer described as, "The best surprise of the evening. Seven gracious young men stealing the show and the hearts of the audience with an astonishing harmonic banquet." The group not only pulled down top honors overall, but also took first place in the category of Best Arrangement for their lush revival of Simon & GarfunkelÕs Bridge Over Troubled Water, showcasing their "gorgeous textures, brilliant arranging, and inspired, soulful delivery." 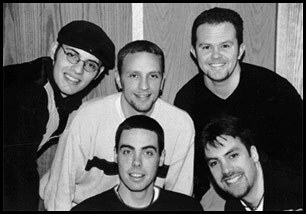 Back in New York during the summer and early fall, Naturally Seven buckled down to work, recording their first CD, Non-Fiction, which has been heralded as, "One of the most electric innovations yet in Contemporary Gospel music." The groupÕs "Gospel background has been good preparation for the brilliant rainbow of tonalities that characterize their technically ambitious, yet passionate approach." Their sound is "urbanized, funky, and immediate. They choose from a palette that is deep, intense and brilliant." Naturally SevenÕs members all hail from the New York Metropolitan Area and have been friends and musical partners, in various combinations, for years. The groupÕs latest incarnation came together last year when Roger Thomas, Naturally SevenÕs founder, arranger and musical director, added two new voices and began to build intricate seven-part harmonies around a fuller sound, artfully blending gospel, jazz, R&B, hip hop and even classical vocal genres. On selecting Naturally SevenÕs members, Thomas says, "They have to have a keen ear for complex harmonies, and be eager to experiment and create what doesnÕt already exist." The six other carefully melded voices are those of Dwight Stewart, Garfield Buckley, Rod Eldridge, Warren Thomas, Marcus Davis and, newest addition, Jamal Reed. Their faith-infused music reaches across denominations, striking common chords of human experience among religious and secular audiences alike. "Most moving is when people find an honesty and spirit in the music. When they are touched right there," Thomas reflects, tapping his chest. For Naturally Seven, the music and the message are inseparable. "WeÕre all about hope. ItÕs spirit, music and entertainment. We want to give you something you remember, that makes you smile and even do the right thing." Marcis Davis, Warren Thomas, Dwight Stewart, Roderick Eldridge, Roger Thomas, Garfield Buckley, David LaRoche. 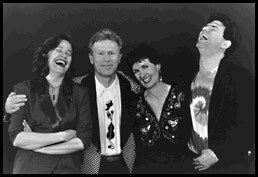 Bay Area - Euphorics: The Euphorics (U4X) are a joyous, energetic a cappella quartet, who, since 1983, have been delighting audiences internationally on radio, television, and concert stages, at schools, festivals, and special events of all kinds. Individually, members of the Euphories are powerful lead singers. Joani Bye (alto), fronts her own band, the Homewreckers, and her voice has graced countless albums (including those of Bon Jovi, David Bowie, INXS, and Cher). Helen Davis (soprano) leads her own jazz quartet and has backed up Doug and She Slugs, and Kathi Hof Donald. Nathen Aswell (tenor) is a free-lance vocalist/bassist and works with a wide variety of people (including artists Susan Crowe and Gary Fjellguard. The CARAS award for Best Children's Album of 1993 and the West Coast Music Award for Best Children's Album in 1998. Together, they create a rich and soulful blend with a repertoire of top-notch originals and innovative arrangements of covers in a wide variety of styles. The Euphorics celebrate their passion for music with plenty of humor and dynamic audience interaction. Boston- Pickup 6: At the crossroads between swinging jazz, sultry soul, and upbeat pop, Pickup 6 delights and entertains audiences with a high-energy a cappella sound. Since 1996, we have journeyed down the musical highway, constantly straddling the double- yellow line between sophistication and fun. Most of our arrangements are by members of the sextet, including standards like "Route 66," blustery, heated ballads like "Fever," or more off-beat fare like "You Never Give Me Your Money" and "Cool" from West Side Story. Performing at jazz clubs and private parties, or spending long nights rehearsing or producing new arrangements, we find joy, challenge, companionship and inspiration in our singing. Chicago - Chicago Voice Exchange: Chicago Voice Exchange have been entertaining and confusing audiences for over 8 years - from corporate to school events, from low brow to high (and even uni-), their insouciance and self-deprecating humor leaves a trail of smiles and broken dishes wherever they go. Winners of the 1995 and 1997 Midwest Harmony Sweepstakes, they just missed a bronze in Synchronized Swimming at the last Summer Olympics. 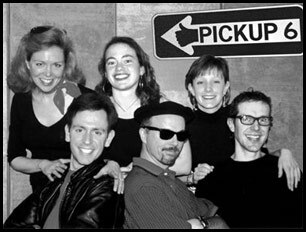 Denver - Octane: They first formed in 1994 as an octet with piano accompaniment while students in the School of Music at Northern Illinois University. 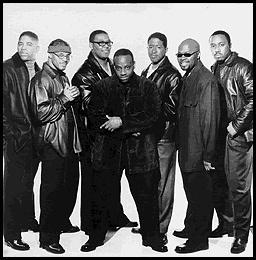 They released their first CD, "High Performance" in this format and became strictly a cappella in 1996. Their local performance experience includes 2 summer retreats for the American Choral Directors Association, 4 performances of the National Anthem and half time shows for the Chicago Bears, second place in the 1997 Midwest Regional Harmony Sweepstakes, summer festivals throughout the midwest, guest entertainers for the Miss Iowa pageant, and many concerts and workshops at schools throughout the area. They performed as representatives of Softline, Inc. at the Sapphire '98 trade show in Los Angeles and were the resident a cappella ensemble from January to July 1998 aboard Celebrity Cruise Lines in the Caribbean and Alaska. Their second CD, "Grand Slam" was recorded while on board. They can also be heard on a Baker and Taylor Entertainment Services christmas compilation CD along with artists Kenny Rodgers, Michael Bolton, James Galway, and Vanessa Williams. They will return to Celebrity Cruises in May of 1999. Los Angeles - Ja'a: When you think of Ja'a, think deep, "funkafied" harmonies. These six gentlemen give you the power and the blend of soulful music that settles into the heart. Their vocal sounds give a smooth and sophisticated flow to all the songs that they touch. These brothers of harmony have continued to move beyond the boundaries of contemporary sound displaying their musical influences from jazz, R&B, contemporary a cappella, funk, pop, and gospel. The members of Ja'a share the vision of transcending the conventional barriers in music and are prepared for "Just About Anything," the operative theme which characterizes their music, attitudes, personalities, and the essence of Ja©ˆa. Since their origin at UCLA back in 1995, Ja'a has been acclaimed for their complex harmonies, a knack for vocal instrumentation, and a flair for appealing original arrangements. Their sophisticated sound is a testament to the heart and soul that they invest in their music and performances. Showcasing their versatile style, this sextet has performed from Vegas to LA, San Diego to the Bay and Asia soon on the way. 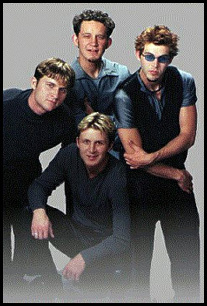 Their spirit and belief in their dream has led to the release of their second CD "Outside the Lines". This group of friends looks forward to sharing their gifts with all who will listen. Mid-Atlantic (DC) - Minimum Wage: Minimum Wage is a sketch comedy, a cappella group that hails from New York City. 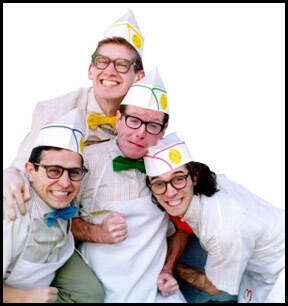 They have performed at venues such as Caroline's Comedy Club, The Bottom Line, Catch a Rising Star, The Duplex and The Bitter End in the Big Apple and all over the tri-state area. They were named "outstanding Musical Comedy Act" at the BackStage Bistro awards and were also Grand Prize Winners on Americas Funniest People. Minimum Wage will be hosting the East Coast A Cappella Summit in Boston this summer and most recently they appeared on Fox TV and can be heard on Comedy Central singing the Little Donnie Foundation theme song for the Upright Citizens Brigade. New York - Naturally Seven: Seven young men late 20's/early 30's from New York Metro Area. With a unique blend of seven-part harmony blending jazz/gospel/R&B, and even classical styles.They mimic instruments from horns to guitar, which will make you find their music a pure delight. Their lyrical content is always inspirational stretching from their various church backgrounds. Although many members have sung in group for many years, Seven was created in September of 1998 and has already started to make waves. Pacific NW - The Standards: The Standards are five Williams brothers from Twin Falls, Idaho singing R&B, Doo-wop, 50’s-60’s jazz, and their original material. They have been singing together as a group since 1994. Jordon is known for his rich tenor voice and extraordinary range. One of his passions is motor cycles and he owns a Harley Davidson, which he built from scratch. Morgan writes most of the original music and creates the artwork for the group, including album designs and promotional material. Nicholas is The Standards’ bass. He is the “comedy of the group,” known for his sense of humor. He is guaranteed to touch the lighter side of the audience. Nathan adds character to the performances with his distinctive voice and original choreography. His dream is to dance professionally in a major Broadway musical. Quinn gives strength to The Standards with his dynamic vocal quality and personal enthusiasm. His interests include roller-blading, snow-boarding, and bothering Morgan if he has nothing else to do in the day. All five brothers are eagle scouts and range in age from 24 to 17. Steve Baker is Executive Director of the Berkeley Society for the Preservation of Traditional Music, the non-profit owner and operator of the Freight & Salvage. Responsible for programming and marketing, Steve joined the Freight in 1983 after serving in the non-profit arts and general music fields as administrator, programmer and traditional folk & country performer. 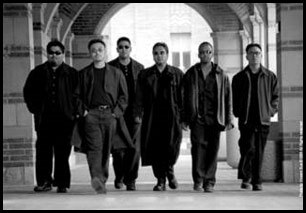 In operation for over 30 years, the Freight is a leading presenter of Bay Area a cappella music. The venue has hosted The House Jacks, SoVoSo, Mary Schmary, +4db and many others. Charles A. Eisler is one of San Francisco's leading producers and managers of live theatre. He has produced Beehive, The 60's Musical in Las Vegas, Detroit, Houston, Fort Worth, San Jose and on tour around the country. In San Francisco, his productions include the Cole Porter musical revue Cole, Forever Plaid and Noises Off. Mr. Eisler has acted as general manager for Sylvia, Free Food, Together Again, starring Sid Caesar and Imogene Coca, Night Dreams and Tunnel Rats. He owns and operates the Mason St. Theatre in San Francisco where Shear Madness is currently celebrating its second year anniversary. On Broadway, Mr. Eisler produced the Alan Jay Lerner musical, Music! Music! He has general managed the National Tours of Man of La Mancha with Richard Kiley and Fiddler on the Roof with Hershel Bernardi; The Abbey Theatre; The Shenyang Acrobats and Wushu Martial Arts Exhibition from the Peoples Republic of China; The National Theatre of Greece; The National Folk Theatre of Ireland and the Gavella Theatre of Zagreb. Mr. Eisler was Director of Productions for New York City Center, at the time, the largest performing arts center in the country. In association with musical director, Deke Sharon; choreographer, Frank Boehm; and writer, Charlie Pearson, Mr. Eisler is developing an a cappella musical for Broadway entitled"Street" . Dr. Suzuki earned a Ph. D. in Historical Musicology at the University of Southern California. He is an Associate Professor in the Music Department at San Francisco State University specializing in Twentieth Century music, as well as teaching Rock History and Music Appreciation. At KPFA, 94.1 FM in Berkeley, he produces and hosts "Discreet Music" (Sundays at 11 pm), an eclectic offering of contemporary, experimental music, with periodic programs devoted to a cappella, progressive rock, sound poetry, sound sculpture and other musical genres and styles. Past in-studio guests and performers include the Bobs, SoVoSo, the Housejacks, the Accidentals, M-Pact, Jezebelle, and others. As a music critic and journalist, he writes for Wired, Pulse, CDnow, Goldmine, Musicworks, Audion, and many other periodicals. Dr. Suzuki is currently completing on a book titled "Minimal Music: Its Evolution and Relation to the Visual Arts." Queenie Taylor s respected and innovative presence in the San Francisco music scene goes back to 1974, when she began a 16 year odyssey at Bill Graham Presents which involved advertising, marketing, entertainment acquisition, and venue and event management. Her experience as an independent producer since 1993 includes booking, promotion and event production. She has produced such events as the San Francisco Symphony's Black & White Ball, Grace Cathedral's Spirit of the City Ball, Focus Magazine's Creative Achievement Awards, Anniversary Galas for Marin County, the Mill Valley Art Commission's Milley Awards and numerous corporate parties. She co-produced Gavin's SFO1, 2 and 3 (1994-1996), music business conventions in San Francisco which featured three days of business panels and breakouts and four nights of events in 35 area nighclubs for over 800 participants. This year's program was the most diverse and exciting yet. Filled with emerging groups, as well as Sweepstakes favorites such as Chicago Voice Exchange, the competition was intense indeed. 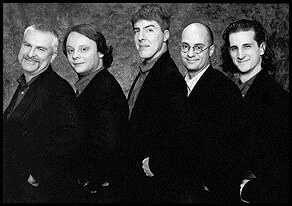 Seven, from New York, garnered top honors, with their intricate and multi-textured voicings, heard to best advantage on "Bridge Over Troubled Water"; the group's arrangements are expanding the universe of sound. Taking second place were the Standards, five brothers whose onstage appeal and energy charmed everyone. Minimum Wage's outrageous humor, as exemplified by "The Last Cowboy Song," had the audience begging for mercy (or more?) Other musical highlights include the ringing tones of last year's champs, Metropolis (a barbershop quartet), the Euphorics, with "Message In A Bottle" and Pickup 6's medley of Beatles favorites.